"Moist and juicy pot roast done in a slow cooker, made healthier with a little less meat and LOTS of fresh vegetables and seasonings." Heat a large skillet over medium-high heat; brown roast on all sides, about 4 minutes per side. Transfer roast to a slow cooker. Pour the beef stock into the skillet, and bring to a boil while scraping the browned bits of food off of the bottom of the pan with a wooden spoon. Add the broth and onions into slow cooker; cover and cook on Low for 5 hours. Add potatoes, carrots, celery, and parsley. Cover and cook on Low until roast is tender and cooked through, 3 additional hours. This recipe is a healthier version of Marie's Easy Slow Cooker Pot Roast. Good, everyday pot roast. With the beef, salt and potatoes, it's hard for me to consider this a healthy dinner. Just healthier than other pot roast options. I added 1/2 cup water. And I added a package of dry onion mix to this. Cooked on High for 4 hours, then low for 3 hours. AWESOME. 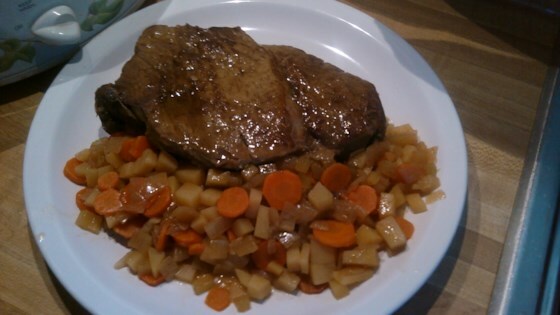 I used the beef broth, apple cider vinegar, parsnips, carrots, potato, fennel, apple. It was fantastic! Could also add some onion, but didn't have room. Used pork roast instead of beef.